Della Air fryer has been one of the best selling air fryers on Amazon. If you are into healthy eating and trying to avoid all the unnecessary calories then you might have come across Air fryers as one of the kitchen gadgets that can help you with it. Air fryers use less than one tsp of oil in order to fry your favorite snacks like french fries, chicken wings or chicken pops. The food is cooked in such a way inside the air fryer that you feel it is as good as the fried food. The Della Air fryer comes in two different sizes and you can compare the pros and cons of both of the airfryers in the post and choose the right one according to your needs. The Della Electric Air Fryer is probably going to be one of the solutions for cooking your favorite snacks without putting on way too many calories. With Air fryers, the food gets the fried taste by just the way it is cooked with the help of hot air circulation. 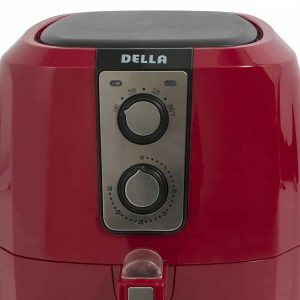 The Della Air Fryers use the same technique, now let’s get a little specific about the pros and cons of this particular Air Fryer. 3. There are two knob regulators, one of them is to adjust the time and the other one is a temperature controller. You have a 30 min timer and a temperature knob where the temperature ranges from 180-390°F. 4. The air fryer does not release any strong odor while cooking which is again an advantage. 5. The Air fryer is easy to maintain and clean as the food basket is dishwasher safe. 6. Most of the dishes either use one tbsp or a little more oil which is pretty amazing as you would have never thought of making french fries with just one tbsp of oil. 7. The food fried in this Air Fryer gives the same taste as deep fried dishes which is pretty rare in the case of most of the Airfryers as they tend to make the food dry while doing this. 8. 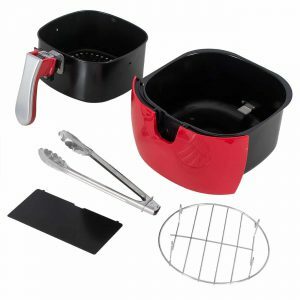 The capacity of the cooking basket is 2.7L which is pretty good when it comes to cooking food for 1-2 persons at a time. 1. One of the major complaints about this air fryer is that the Teflon coating in the food basket comes off after using it for a month or so. Many people have raised this issue and once the coating goes off, most of them were a little late on their return period and hence could not get a replacement or refund. Even though everything about this Air fryer is pretty good, the fact that the Teflon coating gets peeled off is a bummer as most of them have faced this issue making the Air Fryer a poor quality fryer. This Air Fryer is larger in comparison to the previous Della Air fryer and that is why you have the prefix XL. The previous Air fryer had a serious con where the Air fryer is not durable and in the long run, you would be needing a replacement. 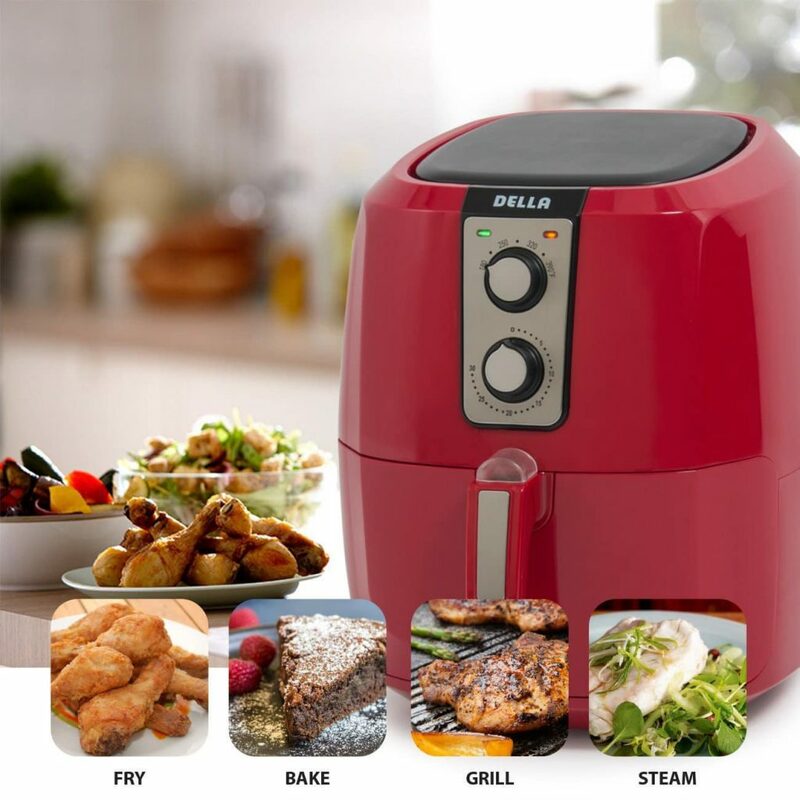 This is another Air fryer from Della with a much better capacity and a few more added features, let’s get into the pros and cons of this Airfryer in order to see if it is worth investing or not. 1. The Airfryer is pretty easy to use and easy to maintain. The size is 5.8 quarts which is pretty good for cooking snacks like french fries or chicken wings for 2-3 people at a time. 2. The temperature knob can be set from anywhere between 0-30 minutes and the temperature can be varied from 180-390°F. 3.The air fryer does not release any strong odor while cooking which is again an advantage. 6. The food fried in this Air Fryer gives the same taste as deep fried dishes which is pretty rare in the case of most of the Airfryers as they tend to make the food dry while doing this. This is very similar to the previous Della Airfryer but it is worth mentioning. 7. The Air fryer can easily cook chicken wings in 15 minutes depending on the quantity you are trying to cook, but overall the cooking is pretty fast. The bottom Teflon coating in the food basket tends to come off after using it for a while. This was similar to the previous Air fryer and it is easy to say that the quality of the Della Air fryer is not up to the mark. It comes off after 2-3 months of use as suggested by most of the user and it is really disappointing. This is a major problem with the Della Air Fryers and almost everyone who bought this Air fryer has a similar complaint. Instead of investing in this Airfryer, I guess you could get the Farberware Airfryer as they too have two similar sizes and they have a much better quality than the Della Airfryers. Overall, the Della Airfryers are definitely packed with different features and in the case you want to fry or cook food in an efficient manner without frying it in too much oil then this is probably the best way you should do it. 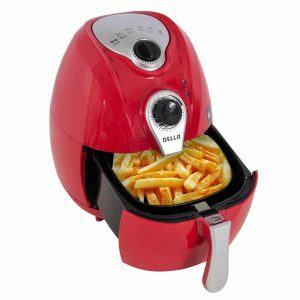 However, there might be a few complaints about the Della Airfryer and you might want to look into other options. With most of their air fryers, the Teflon coating of the cooking basket comes off after a while which is not ideal if you plan on using the air fryer for a really long time. Take a look at the Farberware Airfryers or the Power Air fryers. These two companies have relatively better air fryers, however, you can even go for the Philips Turbostar air fryer which slightly expensive but totally worth it as it works amazingly well. Do let us know what you think about the Della Air fryers in the comments down below! In the case you have any experiences with these air fryers then do share them with us as it would help our readers.